The night writer extends the functionality of LED throwies by allowing a writer to catch a tag in lights. 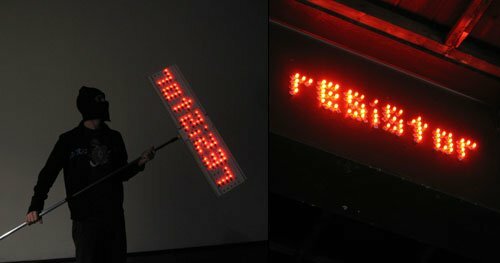 It�s cheap, easy to make and writes 12-inch glowing letters 25-feet in the air on any iron or steel surface�if you stand on a turned over garbage can. That has to be one of the coolest things i've ever seen.